Your estate plan is something that you design now before it's needed, it will operate sometime in the future. So if the plan won't be used until the future, how can you make sure the plan will work? If you do what I call "pressure testing" your estate plan, you will go along way to making sure the plan will work and minimize disputes. 1. Work with a specialist and estate planning expert. It may seem like a simple thing, but nothing will torpedo your estate plan than having a DYI, fill-in-the-blank form or working with someone who does not focus exclusively on estate planning. As I have written before, if you have a problem with your kidneys, you don't go to the foot doctor. 2. Imagine future scenarios with your estate planning attorney. In the design of all estate plans, we have our clients brain storm with us and imagine future scenarios. 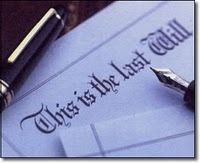 As we do this, we test each part of the estate plan and how it work under that imagined scenario. Does this work if that happens, how does client feel about it, how can they imagine how that provision will impact family or those involved? This is how to pressure test the design of each portion of the estate plan. 3. Review your plan periodically and re-test. As time goes by, provisions that made sense years earlier in your plan may not make sense in the future. Things change, laws change, people change. These changes are always occurring and if ignored can also defeat your estate plan. The way to deal with changes is to review your plan periodically and re-test the provisions given all the changes. This is what we do with every client at every estate plan review meeting. So there they are, the three steps to pressure your estate plan. Do you follow these steps? If not, it's time for an estate plan review if you have an estate plan. If you don't have a plan, these steps will guide you to creating a more effective estate plan. Please let me know if you have questions about pressure testing your plan. Feel free to join in our conversation and leave a comment here or send me your thoughts via email, I look forward to hearing from you. If you are seeking an estate planning attorney in Castle Rock, Douglas County, or for the South Denver Metro Area, contact Kokish & Goldmanis, P.C.